Avail with us, insulating glasses, a insulating glass involves the bonding of two or more parrallel glass panes together to form a hermetically sealed unit. Its Principle is based on a cavity of dry Air or Insert gas between two or more panes of glass. Insulating glass, used in those buildingwhich required high heating or cooling. - IGU glasses are hermetically sealed with a two or more glass lites separated by a dehydrated air space and edge sealed together. - It prevents dew condensation. - It helps to reduce noise pollution significantly. - It helps in energy conservation and helps in maintaining the inside room temperature. Providing and Fixing of IGU made of Asahi / Saint Gobain toughend 4mm clear glass with 10mm Air Spacer Gap and the outer panels shall be of Saint gobain Reflectsol / Anteleo Series 6mm Heat Strengthend glass. The Insulated Glass that we present our clients with are manufactured using two panes of glass that are separated by a space. This space is filled with dehydrated air or a special gas, which does not allow the movement of air from outside into the space. Insulated Glass is a combination of 2 or more panes of glass, spaced apart with a spacer bar and sealed with primary and secondary sealant to form a single glazed unit with one or more air spaces in between. ISOLAR-GLAS® Neutralux ™-Comfortable living conditions and optimum energy balance plus sound insulation! Glass unites fashion and elegance to the interior design.M Designs has a wide range of glass for interiors in various forms and designs. Choose from genuine, glassy and thick glass to maximize space, promote natural light, protect retreat, assure security or improve aesthetics. Glass is used to provide light and allow a view from either side to the other side. The effectiveness of insulated glass can be expressed as an R-value. The higher the R-value, the greater is its resistance to heat transfer. Insulated glass is a prefabricated unit made of two or more glass panes, which have been separated by an air gap and edge-sealed together. 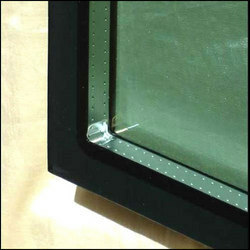 This edge seal not only binds the individual sheets of glass together to maintain the mechanical strength of the joint but also protects the space between the glass from outside influences. Insulated Glass Unit fabricated from two or more glass sheets assembled through one or more airspace fulfilled with air or inert gas separated by a metallic spacer a desiccant is incorporated the whole IG unit has a double sealing.